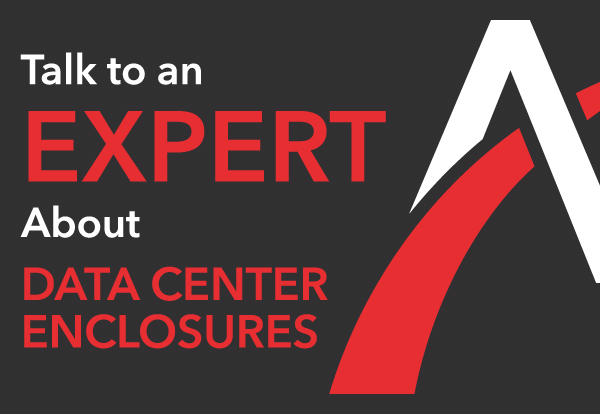 Home » FAQs » Which data center design should I use for airflow management? A room that houses data centers must have an air flow management plan in place to ensure the servers stay at the proper temperature and do not over heat. As you work with your data center designer, he or she will most likely suggest two different models: hot or cold aisle containment. In a cold aisle containment model, servers are arranged in a way that places the server racks’ backs to the outside of the enclosure. The enclosure section contains cool air that is distributed to the front of the server racks, causing hot air to be released through the back of the cabinet racks and outside of the enclosure. Cold aisle containment models are ideal for building owners who are seeking to reduce energy costs. A cold aisle containment system only provides chilled air to the areas where your servers are, which greatly reduces energy usage in comparison to cooling an entire room. Hot aisle containment models consist of server racks arranged in a way that allows heat to escape into the aisles. The heat emitted from data centers naturally rises and is dispensed into return ducts. The outside area of a data center enclosure uses the conditioned air dispersed in the room. This same air is cycled around the server aisle to keep the servers cool and at an optimal operating temperature. Like cold aisle containments, hot aisle models are cost effective, as they contain the hot air to a limited space within an enclosure. Hot aisle containment models are also ideal for those building owners who want to create a scalable data center layout for air flow management. For assistance in determining which air flow management plan is best for your data center design, contact us today.